when the sounds are resonating: orchestral. make it dance continuously, on repeat, to keep a much needed mind-set. Infuriatingly Indestructable, and at that point of my childhood (back In the 80’s) when a little destruction would do me fine. I was convinced that this truck was not a toy, but more — a test! 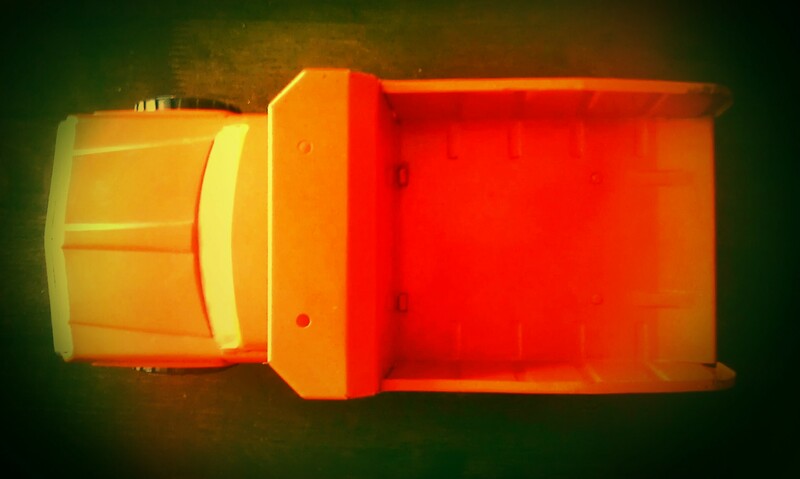 Somehow, forged with alien metals, this orange dump trucks’ durability bore an unforunate resemblance to that of a black box flight recorder (how can it endure such incomprehensible abrasion?). Maybe, just maybe, I’ve been living as a slow aeroplane ever since; having the good sense not to allow myself to crash, all the while i’m harbouring a toy (Yes, I don’t really need an object such as this in my daily life) but realistically knowing there is a possibility of engine failure (but il keep it anyway, because i dare not forget my nice, average boyhood). As my nostalgic tendencies continue to serve me, Is this innocent truck a stark reminder of how fragile (It still has no dents) my adulthood can be, and in the future: will very likely be, if i’m ever so lucky to be so old that i can only remember the distant past (the black box is no longer black, but now, also orange in its colour). laying on clumpy, clay soil.